Sometimes a business needs a completely fresh look, and that’s exactly what Abodebed in Hemel Hempstead wanted. 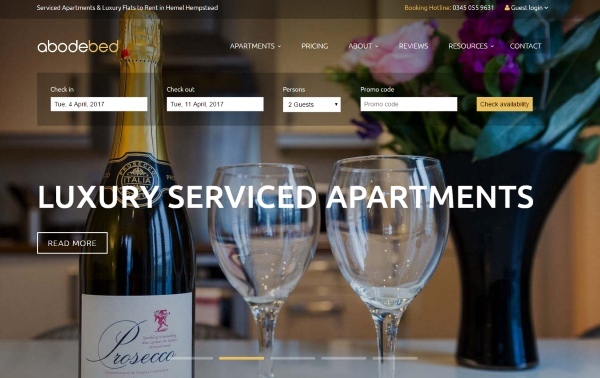 As a company which provides luxury serviced apartments, Abode was conscious that its old website wasn’t as visual as other accommodation sites in the travel industry. That’s why they asked us to completely refresh the brand and build a modern, responsive website filled with high quality, original photography. Good photographs are hugely important to the accommodation industry. It’s not just a ‘nice to have’ aspect – the right photos can mean the difference between a booking or a vacant property. So Cariad’s professional photographer was tasked to take enough stunning images of every room in every apartment to give guests a really good idea of exactly what they can expect. We then changed the layout of the website’s design to give the photos far greater prominence. Whilst visuals are a hugely important part of a website, it’s equally important that your journey through it is intuitive and straightforward. In Abode’s case, many guests will be booking accommodation via their tablets or mobiles, making responsiveness a vital element of the new site. Finally, we also refreshed Adobe’s branding, making it brighter and fresher, and changing the font to reflect modern trends. Whilst they specialise in providing accommodation for business travellers and business people who need to stay in Hemel Hempstead when they’re working away from home, Abodebed’s apartments are also used by tourists and people looking for somewhere to stay between house moves. The apartments are based in the centre of Hemel Hempstead, next to the Riverside Shopping Centre, a short walk from the railway station, and just off the ‘Magic Roundabout’. There are a number of one and two bed apartments, all of which also have sofa beds that can accommodate an extra two people per night. This means that even though the apartments are at the luxury end, they can be more cost effective than hotels, as well as giving guests a lot more space, including living room space complete with a dining room table. Abodebed’s serviced apartments have all the amenities you enjoy at home, including a fully equipped kitchen, as well as WiFi, Sky TV, a DVD player, hairdryer, iron and ironing board etc. Every apartment also has its own dedicated parking space which is an increasingly valuable commodity in any city. If you think your website needs to be more visual, modern and fully responsive, contact us to talk about what you want and what we can do for you.